In 1965 came experimental confirmation of a long expected result - there are three types of color-sensitive cones in the retina of the human eye, corresponding roughly to red, green, and blue sensitive detectors. Painstaking experiments have yielded response curves for three different kind of cones in the retina of the human eye. The "green" and "red" cones are mostly packed into the fovea centralis. By population, about 64% of the cones are red-sensitive, about 32% green sensitive, and about 2% are blue sensitive. The "blue" cones have the highest sensitivity and are mostly found outside the fovea. The shapes of the curves are obtained by measurement of the absorption by the cones, but the relative heights for the three types are set equal for lack of detailed data. There are fewer blue cones, but the blue sensitivity is comparable to the others, so there must be some boosting mechanism. In the final visual perception, the three types seem to be comparable, but the detailed process of achieving this is not known. When light strikes a cone, it interacts with a visual pigment which consists of a protein called opsin and a small molecule called a chromophore which in humans is a derivative of vitamin A. Three different kinds of opsins respond to short, medium and long wavelengths of light and lead to the three response curves shown above. 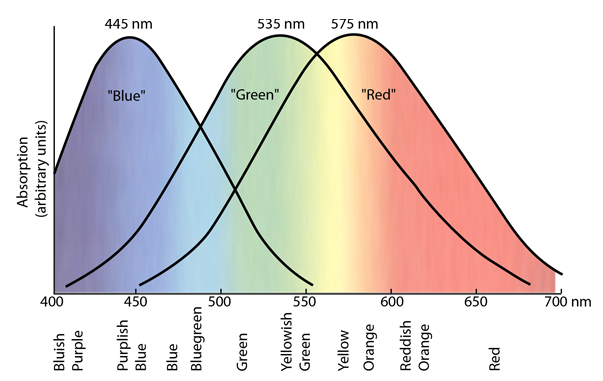 For a person to see an object in color, at least two kinds of cones must be triggered, and the perceived color is based on the relative level of excitation of the different cones.